Radio-Coteau is deservedly a true “cult” Pinot Noir. A “cult” wine is one produced in very small quantities by a very skilled and experienced winegrower and winemaker, sold and tightly allocated through a mailing list, distinguished by unique and special wines, and known only to the most dedicated wine geeks.. 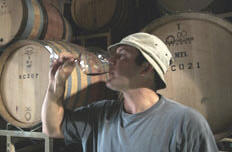 Owner Eric Sussman developed an interest in wine while studying agriculture at Cornell University in Ithaca, New York. He ventured to Washington’s Yakima Valley where he spent several years managing the vines and cellar of a small artisan producer. He then moved on to France and spent the 1995 vintage in Burgundy at Comte Armand in Pommard and Domaine Jacques Prieur in Meursault. After returning to northern California, he worked one year at Bonny Doon and from 1988-2001 as the associate winemaker at Dehlinger. He crossed paths with Bill and Joan Smith, former owners of La Jota, and current owners of W.H. Smith Wines. 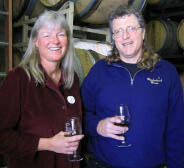 They formed a partnership that became Radio-Coteau Wine Cellars. “Radio-coteau” are two conjoined words derived from the northern Rhone region of France. The colloquial meaning is “word of mouth,” but the literal translation is “broadcasting from the hillside.” Eric first heard this expression from a friend while living and working in Burgundy. It refers to a commitment to community, to growers found by word of mouth, tradition handed down in the cellar, and friends helping at harvest. I recently tasted through the 2004 lineup of Pinot Noirs which were released in March, 2006. Once again, I came away very impressed by the complex array of flavors, the voluptuous textures, and the sensuality of the wines. 14.4% alc., 760 cases, $40. This wine is named for the fog (“La Neblina” is Spanish for fog) that is ever present in the cool vineyards of the western Sonoma Coast. A blend of grapes sourced from two vineyards along the Sonoma Coast (growers Kirk Lokka and Bill Smith), the clones are Dijon 115 and 777. · I love the aromatics featuring perfectly ripe Pinot fruits. There is a panoply of wonderful flavors including black cherry, cassis, mushrooms, spice, smoke and earth. This is the most structured of the three wines, yet light as a feather. A warm fuzzy mouth feel leads to a finish that is long and pure. 14.4% alc., 480 cases, $48 This prestigious vineyard farmed by Richard Savoy is the source for many notable California Pinot Noirs (Adrian Fog, Barnett, Littorai, and Roessler). This hillside vineyard is located in a cool, yet sunny site northwest of Philo and has a multiple range of clones, exposures and soils. The vineyard was planted in 1992 and 1996. This bottling contains Pommard, Dijon 115, and Martini clone. · This wine has very nice soft red Pinot fruits on the nose and on the palate accentuated by floral and spice elements. The sweet fruit flavors linger on the finish. The whole package is nicely balanced. 74 cases, $48 (sold out). This is also a debut-bottling from a hillside vineyard farmed biodynamically by the Benzigers. The vineyard is southwest of Freestone, a few miles inland from the Pacific ocean. It was planted in 2002 to Dijon clones 115 and 777. I did not receive any allocation of this limited-production wine so I cannot provide any tasting notes. 14.6% alc., 100 cases. · Tasted last year, this was a bruiser that needed a lot of air time. Now it is flat-out terrific. The aromatics are rich with dark cherries, dark plum, rhubarb, tea and oak. Beautiful dark Pinot fruits with earthy undertones which are mouth-coating. With air time the wine becomes as soft as a Pinot Noir marshmallow. I would match this against any Burgundy any time. One of the best Pinot Noirs I have drank this year and the stuff that Pinot dreams are made of. 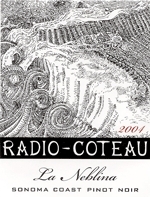 Radio-Coteau is a virtual winery with an excellent website: www.radiocoteau.com. There is a mailing list signup on the website, but at this point, do not be disappointed by very limited allocations. The W.H. Smith Wines 2005 Pinot Noirs have just been released. There are two wines: 2005 W.H. Smith Wines Sonoma Coast Pinot Noir ($28) and 2005 W.H. Smith Wines Maritime Ridge Sonoma Coast Pinot Noir $52. The Smith’s first vintage of W.H. Smith Wines was 1992. In 1994, they purchased 260 acres above the town of Cazadero on the Sonoma Coast. The first vintage of Maritime Ridge Vineyard from this property was 2002. The wines from this vineyard have been rich, plush and complex and highly touted by the wine press. I recently drank the 2003 W.H. Smith Wines Maritime Ridge Sonoma Coast Pinot Noir. A superb wine with ripe fruit aromas, a velveteen texture, coating tannins, and a long and intense finish. The wines are sold to a mailing list in six bottle increments only. 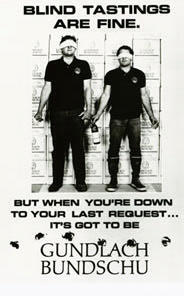 The website is www.whsmithwines.com and the phone is 707-965-9726. The 15th Annual Salud Pinot Noir Auction in Oregon, was held November 11 and 12, 2006. The event raised a record $752,695, with $166,400 coming from the barrel auction of unique Pinot Noirs. 42 of Oregon’s top wine producers provided barrel samples of the 2005 vintage for the fundraiser. The majority of the 168 case lots went for more than $1,000, with several topping $2,000. Auction events included a tasting on Saturday at Domaine Drouhin and a dinner on Sunday at the Governor Hotel in Portland. The co-chairs of the event were Danielle Andrus Montalieu of Solena Cellars and Adam Campbell of Elk Cove Vineyards. Oregon vintners are passionate about Salud which provides healthcare outreach services for seasonal vineyard workers and their families. Salud is a bi-lingual, bi-cultural service involving a dedicated group of Oregon vintners and volunteers associated with Tuality Healthcare Foundation. “Salud” refers to the traditional Spanish toast, “to your health.” In 2005, Salud served over 3,000 qualified individuals. The 2007 auction will be held on Friday and Saturday, November 10 and 11. For more information, visit www.saludauction.org. The Grand Harvest Awards International Wine Competition is open for registration. 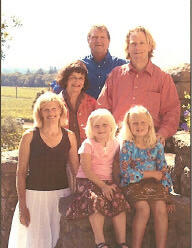 The 2007 Grand Harvest Awards takes place February 21-23 at the Fountain Grove Inn, Santa Rosa, California. Results will be published in Vineyard & Winery Management. The deadline for entries is January 19. Register online at www.vwm-online.com or phone 800-535-5670 x106. The Grand Harvest Awards is the only North American Wine competition that presents wine entries to judges according to regional classification. Wines of particular appellations are arranged in flights and tasted by judges selected for their knowledge of regional characteristics. After scoring, judges seek to identify the distinctive elements of terroir and its link to regional typicity. I am often asked to refer readers to wineries to visit. Generally, the most rewarding experiences come from scheduled appointments with the owner and or winemaker. However, in some instances the consumer ends up in the tasting room expecting at least some modicum of friendliness and attention. One of my readers had a very unfortunate experience recently and I thought I should relate the story. In a recent issue of the PinotFile I wrote an article about the Babcocks, their excellent wines, and their restaurant in Seal Beach called Walt’s Wharf. I have referred pinotphiles who are visiting Santa Rita Hills to Babcock Winery based on the high quality of the wines. Unfortunately, I am afraid that the movie Sideways has overwhelmed some Santa Barbara wineries like Babcock, brought them added success and notoriety, and the personal touch has been lost. Aubert de Villaine wrote a summary of the 2006 harvest at Domaine de la Romanée Conti and through the courtesy of Wilson Daniels, the exclusive United States importer, I was able to obtain a copy. I think this is of great interest to all lovers of Burgundy and I would like to reprint a portion of it here. The report from the Domaine was written on October 19, 2006. At the time of this writing, the vineyards, emptied of their fruit, had begun to change color. The villages were quiet again after the hubbub of harvest. The streets were filled with generous fragrances coming from the wineries where fermentations were proceeding. The birth of this new vintage is always a real pleasure to the senses. * A long, unusual heat wave in July that stopped the vegetative cycle of some vines. Although most of them displayed an amazing ability to withstand the stress. * The coolest and rainiest August since 1986, favorable to botrytis that set in very early. * After the unpredictable extremes of heat, cold and humidity, one decisive factor appeared that brought the vintage to a happy end: hot weather, without any rain, that lasted for the entire month of September (except for a stormy couple of days on the 23rd and 24th). These ideal conditions permitted the vineyards to efficiently use the water retained in the soil from the rain in August, therefore allowing the ripening process to accelerate greatly. In September, the sugar levels increased by almost 2 degrees per week at times, especially during the third week. The harvested grapes were as ripe as in 2005. Botrytis reappeared during harvest on the stormy day of September 24. Luckily, it was too late in the season, and the episode was too short to cause damage. Although the year was difficult, it gave the vigneron the opportunity to make great wines, as long as he or she had used the right means to harvest ripe grapes before the botrytis did too much harm first, Controlling yields was essential. The fine “Pinot Noir fin” that bears small clusters with small berries showed how its predominant presence is important in our vineyards, although it was still necessary to thin the young vines at the time of veraison. In such climatic conditions, only low yields could first allow the vines to fight the heat and later the attacks of botrytis, then to mature early - something that was necessary to allow us to harvest before the rain returned. An ultra-meticulous sorting was crucial in order to eliminate the botrytised grapes. In the winery, Bernard Noblet’s team performed “haute couture” selection on the sorting table and put the finishing touches to the pickers’ work. To summarize, the conditions were difficult in the beginning of the season, but excellent by the end, giving us the opportunity to bring in ripe, sugar-rich grapes. We feel as though we adjusted everything as precisely as was possible. We harvested in the following order: Richebourg, La Tache, Romanee-Conti, Romanee-St.-Vivant, Grands-Echezeaux, Echezeaux. The yields of the red wines did not exceed 28 hl/ha. The Montrachet was harvested near the end of the season on September 26. The low yields and the ripeness of the Chardonnay grapes, gold and juicy, full of sugar and slightly botrytised - just what is needed - should give a great 2006 Montrachet. The beginning of the fermentations were rapid and spontaneous, the vinifications proceeded without any difficulty. The vatting lasted, as usual, around 18 days. It is too early to give a definitive opinion about the quality of the 2006 vintage, but the first wines seem to meet our expectations. The history of California wine is an interesting tale of immigrants who survived earthquakes, Prohibition, and multiple other insults to succeed in the wine business. Gundlach Bundschu can date its origins to a time when buffalos roamed the plains, and today they are producing wines of superb quality from their Rhinefarm Vineyard in Sonoma Valley. 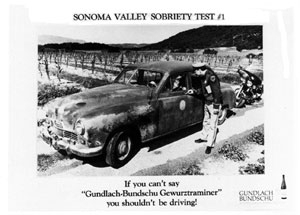 Gundlach Bundschu is the oldest familyowned and operated winery in California. The sixth generation of vintners at Gundlach Bundschu (try saying that after a few glasses of Pinot) is committed to remaking their estate in the image of the world’s greatest estate wineries. The story of Gundlach Bundschu is interesting. Bavarian-born Jacob Gundlach immigrated to San Francisco in 1851 and developed a successful business known as Bavaria Brewery. He was also winesavvy, and in 1857, purchased 400 acres in Sonoma and named it Rhinefarm. The following year he traveled to Europe and brought back rootstock as well as his new bride, Eva. His first vintage at Rhinefarm was in 1961. Charles Bundschu, from Mannheim, Germany, married Jacob Gundlach’s daughter Francisca in 1875. His accomplished business sense steered the J. Gundlach & Co. to considerable success for the next 30 years. Rhinefarm wines were distributed from the firm’s San Francisco headquarters that spanned two city blocks. After Jacob passed away in 1894, the company was renamed Gundlach Bundschu. All of the family including Jacob’s sons Carl and Heini and Charles’ sons Walter and Carl E. Bundschu, participated in the continued success of the firm until the 1906 San Francisco earthquake caused a sudden halt to the momentum. Company offices and wine vaults were destroyed. Despite the damage, the Bundschu family continued limited production and distribution from Rhinefarm. With the passage of Prohibition in 1919, the winery closed its doors and pear trees were planted on Rhinefarm. This is part of the new commitment to quality estate wine production and the desire to leave behind wines whose quality no longer meet the winery’s standard. Gundlach Bundschu has partnered with Wilson Daniels to enhance distribution and marketing. The winemaker at Gundlach Bundschu is Linda Trotta, a Southern Californian of Italian heritage. She attended University of California Davis intending to be a math major, but her travails with calculus led her instead to the department of fermentation science. After graduating, she gained her winemaking experience in Italy and in California at St. Francis and Sebastiani. She joined Gundlach Bundschu and became winemaker in 1990. The Pinot Noir grown on the Rhinefarm Vineyard is located on the lower portion of the vineyard, a section that is across the street from the Carneros appellation border and therefore shares the cooling benefits of the wind and fog from San Pablo Bay. The Huichica clay-loam topsoil is only 22”-30” in depth, beneath which is compacted Carneros Bay sediment that naturally restricts vigor. The climate and soils combine to produce maximum hang time and tiny berries. 14.8% alc., 3,318 cases, $32. The 2004 vintage, the 146th harvest on Rhinefarm, was the earliest on record. Two-thirds of the fruit came from vines planted in 1970 (one of the oldest Pinot Noir vineyards in California) consisting of Wente and Hanzell clonal selections. The other third came from vines planted in 1999 consisting of Dijon 115 and Pommard 5 clones. Winemaking included pre-fermentation cold soak, twice-daily gentle pumpovers, and aging for 11 months in 40% new Tonnellerie Remond oak barrels. · There is noticeable, but not obtrusive, oak influence in this refreshingly crisp Pinot Noir. Scents of cherries and herbs are accompanied by tastes of savory berries, black cherry and clove. Sleek and balanced, the wine finishes clean with fine dusty tannins and uplifting verve. Gundlach Bundschu is located five minutes south of downtown Sonoma at 2000 Denmark St. The tasting room is open 7 days a week, 11:00 - 4:30. It is built around the original winery structure, with stone walls dating to 1870. A picturesque picnic terrace is adjacent. The winery’s caves can be visited by appointment. The phone is 707-938-5277 and the website is www.gunbun.com. “I have never been a champion spitter, in fact, it took me a long time to get comfortable with the practice. I would dribble, drool and dither around the spit bucket wishing for invisibility. I was happy when I didn’t spit on my shoes. I was so awkward, a friend once tried to teach me how to spit. On reflection, that was silly. There wasn’t much to learn - I just had to get the wine out of my mouth. I’ve noticed I am not alone and alot of people find it awkward to spit. It’s not just the act of spitting, it’s also the “how” of spitting. And the “how” is quite simple. You don’t need a special technique, great aim or ability to shoot for distance. Just position yourself close to the bucket - pucker and spit. Believe me, no one will be critiquing your style, because who really wants to watch someone spit.” I can add that you might consider practicing at home with water. The Bouilland Symposium is a 10-year-old training program for wealthy Wall Street wine enthusiasts who are interested in purchasing a Burgundy vineyard or domaine. Each boot camp session is limited to 10 students for each of its twice-a-year gatherings, and costs $8,350. Becky Wasserman founded the symposium in 1996 and all of the 150 Burgundy investors that have attended have aspired to own a domaine. Wasserman moved to Burgundy from New York in 1968 to sell oak barrels (Tonnellerie Francois Feres) from her farmhouse in Bouilland. In 1979, she formed Le Serbet Sari as a wine brokerage to represent domaine owners. She was the first American wine broker to live and work in Burgundy and one of the first to deal primarily with grower-producers who bottled their own wine (estate bottlers). At the time, very few producers in Burgundy shipped their wine beyond France. Today she has seven employees at her office in the former chancellery of the Duke of Burgundy in Beaune and exports Burgundy from 130 domaines. Francois Freres has become one of the largest single tonnelleries in Burgundy. Investing in a domaine is expensive and very risky. As reported in the International Herald Tribune (September 27, 2006), none of the potential buyers do it for the money. A return of 4 percent is considered good, with most Burgundy domaines turning between a 2 and 3 percent profit. It is the lifestyle and the lure of investing in 2,000 years of Cote d’Or winemaking that appeals to investors. It costs up to five generations to pay off a grand cru investment. Francois-Henri Pinault, CEO of Pinault-Printemps-Redoute, and owner of Chateau Latour in Bordeaux, paid $22.3 million for control of 6 hectares of Domaine Engel vines in Vosne-Romanee that produces Clos Vougeot, Echezeaux and Grand Echezeaux.